Dae Min reeled, tumbling on his back when Yoon Hee’s fist connected with his face. He tasted blood and the bitter taint filled his throat, eviscerating Jae Shin’s delicate lemon taste he’s savoured for so long. Slamming into the wall, his weight shattered the frame around the mattress pad, fragments of rice paper and thin wood exploding into the air. She stood over him, shaking her hand out before clenching it again. With her knuckles scraped from hitting Dae Min’s mouth and her stolen wig perched precariously on her head, Yoon Hee reared back her fist, prepared to hit if the man attacked. Sun Joon would have smiled at the sight of Dae Min’s face turning white when he realized who was standing behind Yoon Hee but the coldness of his temper rose at the abuse the young scholar flung at his Yoon Hee. Calm and determined, he stepped forward, intent on ripping Dae Min’s head from his neck when Yoon Hee placed a hand on his chest. “I’ll watch him,” Three voices rose in unison and the friends looked at one another with varying degrees of emotion. “Thank you, Doctor Jung,” Sun Joon accompanied stood to accompany Jung to the door, bowing in respect before sliding the door panel closed. His fatigue set in, a bone-weary tiredness draining him dry. Removing his gat, Sun Joon set it down and looked down at the man lying unconscious in the middle of the room. Following Yoon Hee’s being exposed as a woman, the three roommates were relocated to different quarters; Yoon Hee and Sun Joon housed in smaller single rooms with Jae Shin occupying a larger senior room between them, an unlikely chaperon set between the two more stalwart and traditional scholars. Left once again to his own devices, the rebel scholar took little care with his bedding, often shoving it aside and out of the way rather than using it to sleep on. As a result, maneuvering the mattress pad and bedding took more time than getting Jae Shin under the linens and Sun Joon’s now ached from the chore of Jae Shin situated and ready for Jung’s examination. Hunkering down next to Jae Shin’s shoulder, he looked at the others sitting on opposite corners of the mattress pad. Yoon Hee’s colour was up; her cheeks still pink from the cold and blood lust. Despite the difficulties in getting Jae Shin out of the tea house and back to the university, she’d soldiered on, once again amazing Sun Joon with her resilience. Yong Ha, however, was another matter. They’d had to send word to the riverside tea house, asking Yong Ha to please return to the college. Sun Joon purposely wrote out a careful note, not wanting to alarm the older scholar but at the same time, expressing an urgency for his presence. He’d arrived after Jung did, his fox-like face curled into a false smile as he entered Jae Shin’s room. A smile that melted into vapours when he saw the too-still form of his friend on the floor. His questions had to wait and Sun Joon saw the difficulty Yong Ha was having with his patience. When Jung lowered the blankets to listen to Jae Shin’s chest, he saw Yong Ha recoil at the sight of the savage bite mark purpling the crook of Jae Shin’s neck. For a moment, the scholar believed Yong Ha was disgusted by the obvious sight of his friend’s sexual needs but something in the man’s expression said pain and hurt more than judgment and recrimination. Now with Jung gone, the time for Yong Ha’s questions had arrived. “How did he get like this?” For a first question, it was a good one. An even-toned query Yong Ha almost prided himself on but the quiver in his voice gave away the depth of his emotions. “Daemul,” Sun Joon ignored the puffing of Yoon Hee’s chest at the use of her nickname. Her ego had grown large enough over the night’s adventures. “She went looking for Jae Shin after…” He was loathe to lay blame on Yong Ha, especially when the man’s complexion was ice white with fear. “I should never have left him. This is on me.” Yong Ha cut her off and the room grew silent and heavy. After taking a few breaths, he motioned for Yoon Hee to continue. You mean when is he going to trust again? Yong Ha thought bitterly. He trusted more before this… before I let him down. “Where is Kim Dae Min now?” Yong Ha asked. His demeanor was quiet, nearly subdued compared to the forceful expressions he was known for. It was as if having Jae Shin lying nearly dead-still on the mattress sucked the life from him as well. They left with a minimum of complaint, mostly Yoon Hee insisting on arranging items around Yong Ha so he would have everything within his reach. Promising to call for them if he needed someone, he sat quietly as they bickered their way out of the room, shutting the warmth in behind them. The wind battered the building, tearing at the landscape around them. Despite its howling, the room was too silent for Yong Ha’s liking. Jae Shin was too silent for Yong Ha’s liking. He leaned over Jae Shin, turning his head so the man’s breath ghosted over his cheek. 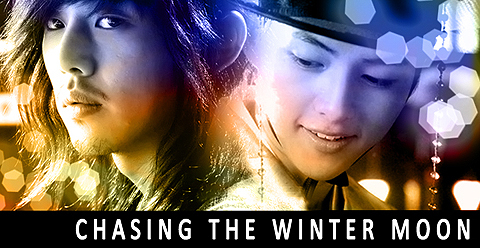 The soft shushing exhale warmed the cold chunk of ice encasing Yong Ha’s heart… the frosted over hardness that formed when he opened the door to Jae Shin’s room ready to fling hot, angry words in his friend’s face. Yong Ha’s heart stopped beating in that horrifying moment and he wasn’t certain it had started up again. Or if it would once Jae Shin opened up his eyes and saw him there. The mottling on the man’s neck terrified him nearly as much as the unconscious state he’d found Jae Shin in. Yong Ha had left little bites on others, tiny scallops of tingling pleasure meant to excite even after a lover has parted but the mauling of Jae Shin’s neck made him sick down to his soul. And the tiny teeth marks near Jae Shin’s belly broke his heart. Shedding his head covering and outer jacket, Yong Ha stretched out besides Jae Shin, wrapping an arm around the man’s torso. He caught his breath every time he heard the man’s heart skip and his tears fell to be absorbed into the bedding tucked around his friend’s body. Tentatively, he undid the pin and hook holding his hair up and tucked himself closer, needing to feel the warmth of Jae Shin on him. With his soul scraped raw and bare, Yong Ha buried his face into Jae Shin’s chest, letting go the anguish he felt inside of him. Guttural sobs rocked his body and he gasped for air, wishing he could somehow absorb the damage done to Jae Shin. Every fibre of his being ached to hear the man laugh; even if it was at him. Anything would be preferable to the nothingness that lay beneath him. A cry he couldn’t catch escaped, the heartfelt whimpering pain oozing from his throat and Yong Ha bit down on his lip, wishing for the first time in his life to have the control he mocked Sun Joon for having. Letting his eyes overflow, he lay against the man he loved more than his own life. It was a hateful nickname, one Yong Ha wished he could bury beneath miles of dirt and rock. Growing up with it made him choke down every bit of lotus root he found in his meals; a long standing vengeance exacted through meticulous consumption. He’d cast it off when he’d entered school, swearing the one person who knew of its existence to a secrecy never to be violated for any reason, yet hearing it in Jae Shin’s rough, scraped-up voice was one of the most beautiful things he’d ever experienced. As was the man’s hand lifting up to caress his hair. The flames could be seen from several streets away, a pillar of fire reaching up into the winter sky. After dodging several merchants scrambling to get their stalls packed up and out of the way in case it spread, Sun Joon finally came upon the immense pyre burning bright despite the wintery sleet falling over the city. Several city men stood nearby, water buckets readied for action but they held back, their nervous eyes flitting from the fire then back to the impassive face of the brilliantly clothed man standing in front of his handiwork. “This is the bar, I take it?” Sun Joon asked, clasping his hands behind his back. Something popped inside of the falling structure, followed closely by a small boom as a jug of alcohol surrendered to the flames. The fireball it created rolled up into the smoky canopy, crackling like a demon from a fairy tale as it rose to the sky. “Yep.” Yong Ha fanned himself, wafting away the ash specks clotting the air. “Is the tea house next?” By Sun Joon’s reckoning, it was a valid question, especially considering the maniacal gleam in his friend’s eye. oh yayyy!!! finally...a shine of hope *teary eyes* Isn't it wonderful for 2 peoples so in love finding one another at last??? What money can do... it can even burn down a newly-purchased bar. I love you! ^_^ Just leaving this random comment before I finally go to bed. Keke. So proud of your frequent updates even if I don't read this story. Daemul fist in the face ftw! :::GRINS::: ♥♥♥♥she packs a good punch. However, I really hope this means they are getting somewhere. Now I just need Yong Ha and Geol Oh to talk things out and just admit they love each already. Silly fools. Reading this fast before I need to rush to work! GOD DAMMIT UNNIE WHY SO GOOD? ♥♥♥♥♥ hugs.... you shouldn't be late for work! GO GO GO! ♥♥♥♥♥ it'll be here! ah...isn't it lovely that YongHa has finally got his courage back. Way to go Yeorim! Nothing like almost loosing the person you love to make you bulk up ^^.